Clay pigeon shooting involves shooting at clay targets (no real pigeons are harmed so you don't need to worry about that!). It's not as easy as it sounds, and you'll need real patience and composure to come out on top, not to mention impressive hand-eye co-ordination and quick reactions. Guns of different strengths are available, which makes clay pigeon shooting a good activity for both adults and children. Although it obviously involves shooting, clay pigeon shooting is actually one of the safest rural sports, so it's ideal for the whole family to take part in. If you're looking to get more serious about clay pigeon shooting, joining a club is one of the easiest ways to get involved. This gives you the chance to interact with fellow enthusiasts and learn the ropes from more experienced club members, most of whom will be more than happy to pass on their expertise. New members are always welcome at club events, and can be taught the basics if necessary. You'll look more professional though if you are already armed with at least a basic knowledge of the rules and how to participate when you turn up. Alternatively, a clay pigeon shooting experience package is ideal if you're only wanting to get involved on a one-off or occasional basis. A full safety briefing and introduction to clay pigeon shooting is included, so it doesn't matter if you've never tried it before. Prices range from £35 to £100 per person depending on your location and the number of clays that you're purchasing as part of your experience package. If you're looking for a different experience, you can book a clay pigeon shoot for a corporate event, or a Stag or Hen party. You can pretty much guarantee that your guests won't have been invited to anything similar! Most venues also offer birthday shoots. If you're only going to be taking part in clay pigeon shooting occasionally, you don't need to worry about getting yourself a shotgun license, as most clay pigeon shooting clubs will have an exemption license which allows members who don't have one to shoot using their facilities and equipment. If you're intending to take up the sport on a more regular basis, you should look into applying for a shotgun license. Anyone can apply and will usually be granted one (unless you're banned from using firearms because of a custodial prison sentence) once the police have checked out your background. Clay pigeon shooting is actually one of the safest rural sports -despite the shooting element! Don't be alarmed by the name, as the pigeons involved are of the clay variety. An experience package is a simple way to get involved if you're just looking to try the sport. 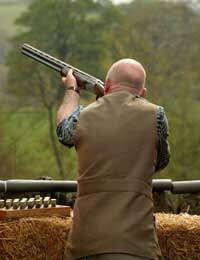 Joining a clay pigeon shooting club is probably the best option if you intend to enter the sport on a regular or semi-professional basis, as you can gain helpful hints from more experienced club members, as well as using the club facilities and equipment to practice your shooting skills.